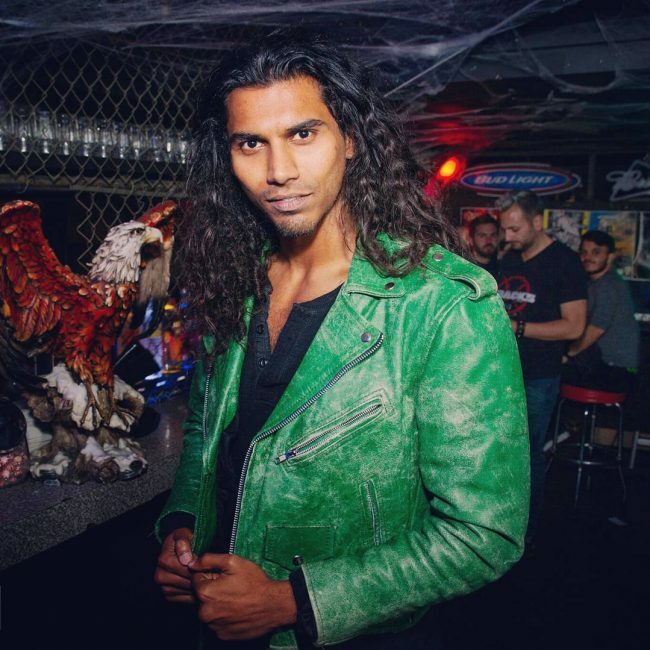 If you do not have a green leather jacket in your wardrobe, it is high time you considered getting one. The jacket will go well with most of the clothes you have in your wardrobe, be they shirts, jeans, T-shirts, official trousers and so on. You can wear it both casually and officially. 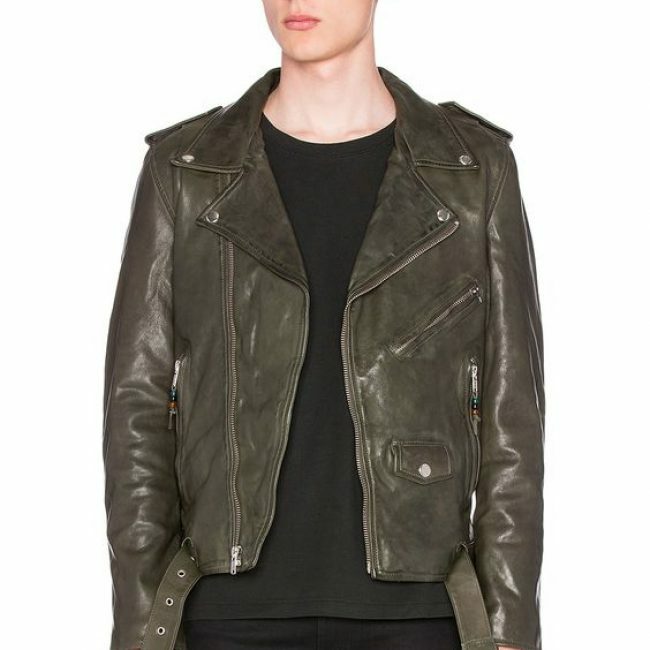 No matter if it is winter or summer, you can wear the leather jacket with anything you want. 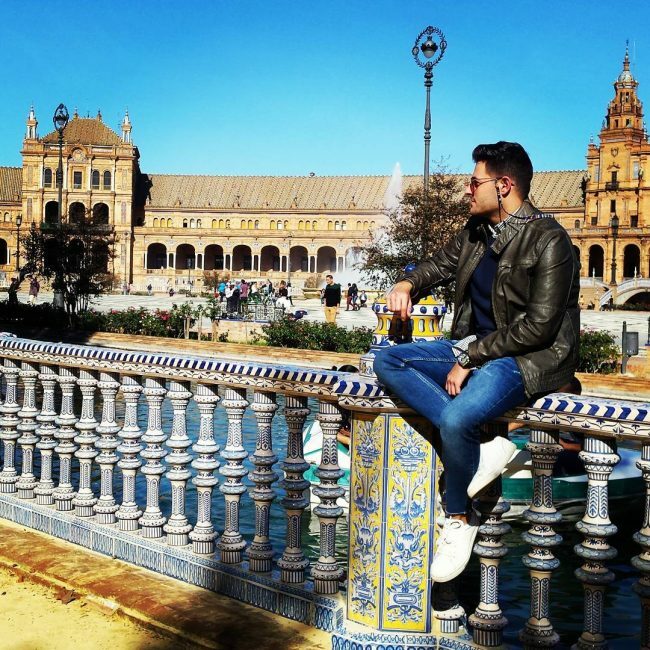 The following are some of the great ways to style your leather jacket for a stunning look that will leave people staring at you. Green khaki and blue are two colors that go really well together. The jacket and jeans will be completed well with a white T-shirt. During the weekend, you need to try and deviate from the norm by trying out adventurous or daring outfits. 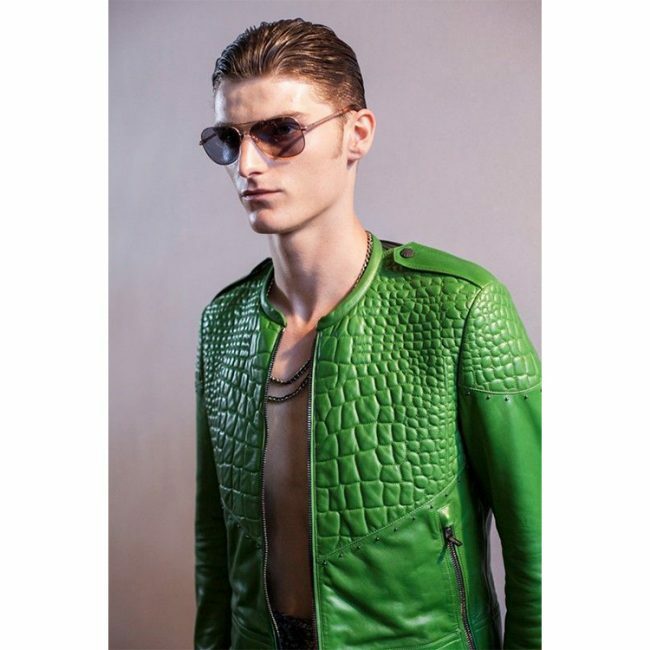 This bright green leather coat will be perfect for a casual weekend look. Who said an official look has to be the usual suit and tie style? You will still look official and awesome in a green khaki jacket combined with a white shirt, navy blue tie and gold trousers. 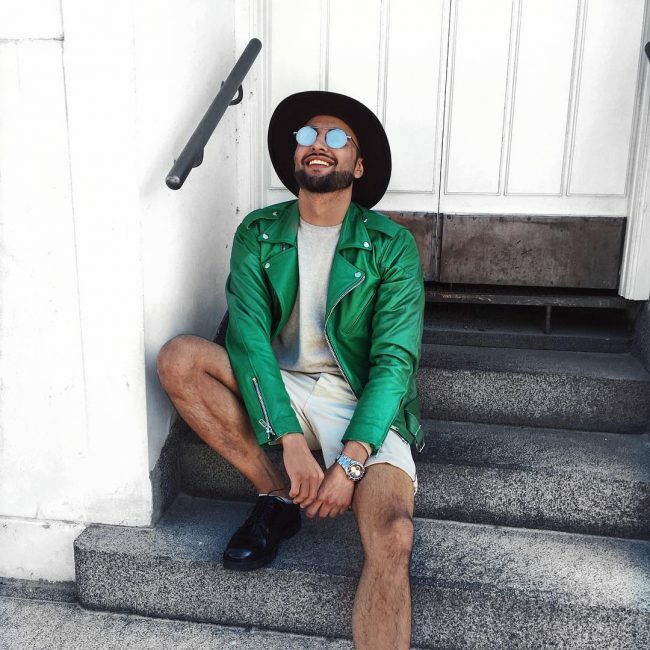 A bright green leather coat when combined with a white T-shirt and white shorts will give you a nice street look. If it is a sunny day, black shades will go well with this look. 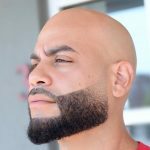 This is a nice style for men who like looking sporty. 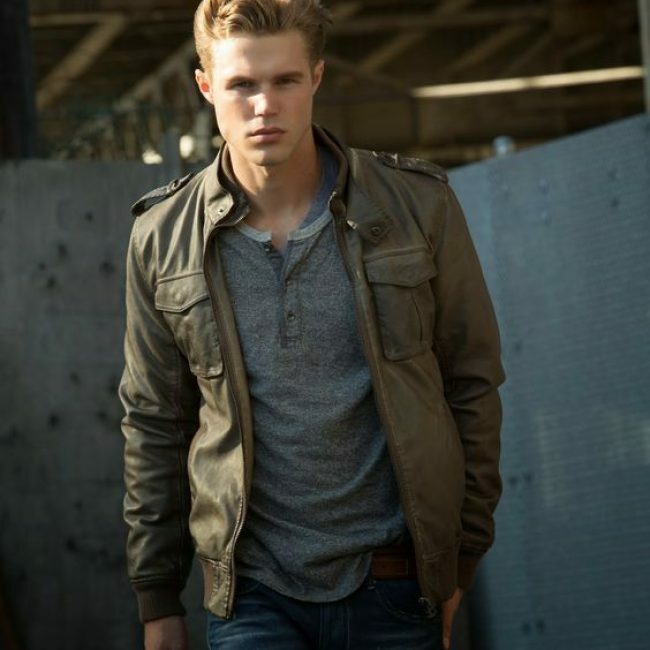 The stylish green jacket and the navy blue jeans will make you look really handsome. This relaxed style that features a dark green jacket, blue jeans and white sneakers is perfect for Sunday. A black or white T-shirt will be perfect to complete this look. It is without a doubt that most young men love looking fashionable. 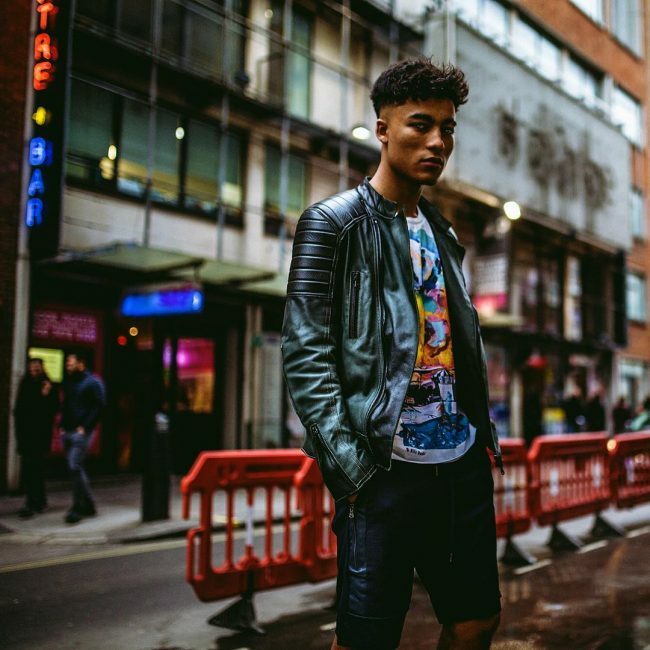 A cool green leather coat and a grey T-shirt is one stylish look you need to try if you a young man. This jacket is perfect for casual wear. The hunter green look that it features looks great with the wool pants and the casual suede sneakers. This style looks simple, but it is actually very sophisticated. 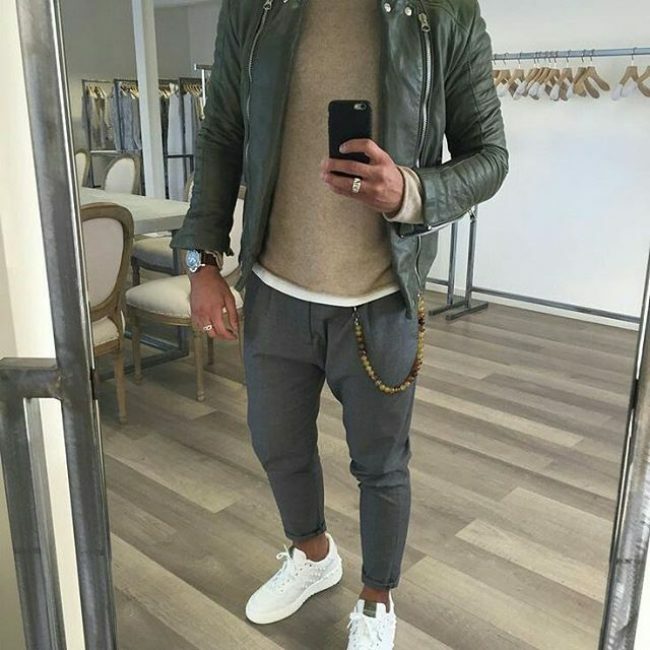 The green leather coat looks absolutely great with the gold T-shirt, tight grey pants and white sneakers. 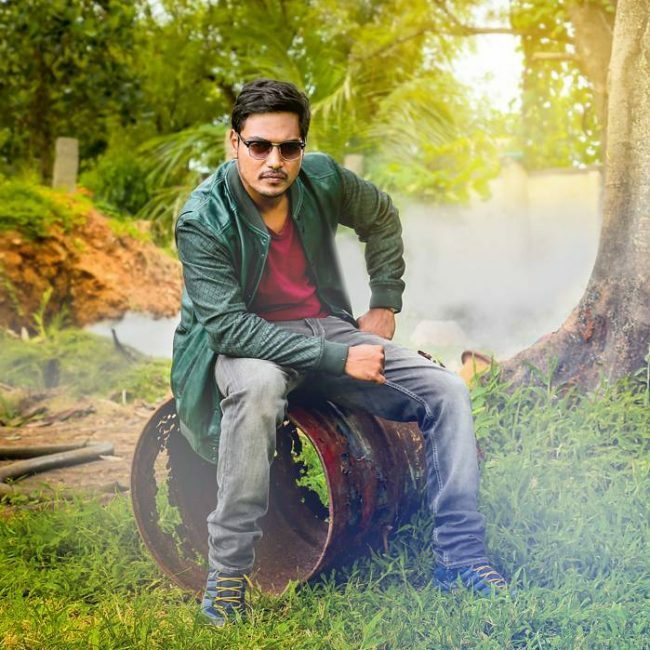 If you are the kind of man who appreciates a rugged look once in a while, you need to try this look that features a green jacket, baggy jeans and maroon T-shirt. Blue sneakers and brown shades will look awesome with this style. A nice green body-hugging jacket combined with a grey V-neck T-shirt and blue or black jeans will give you a perfect gentleman look. 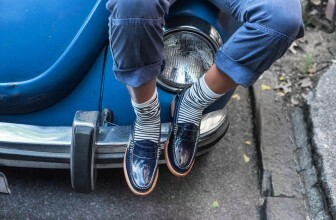 It is an effortless style for young men. Neon leather coats never disappoint especially when worn by young men. This green one will look perfect with black or grey jeans. This is a nice fashionable coat to include in your wardrobe. 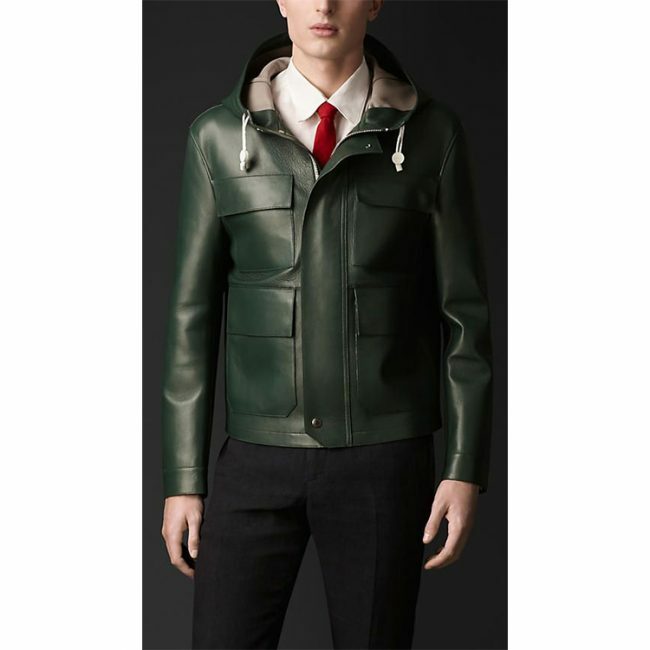 It features textured leather and a beautiful laurel green color that will match well with blue, black, or green jeans. 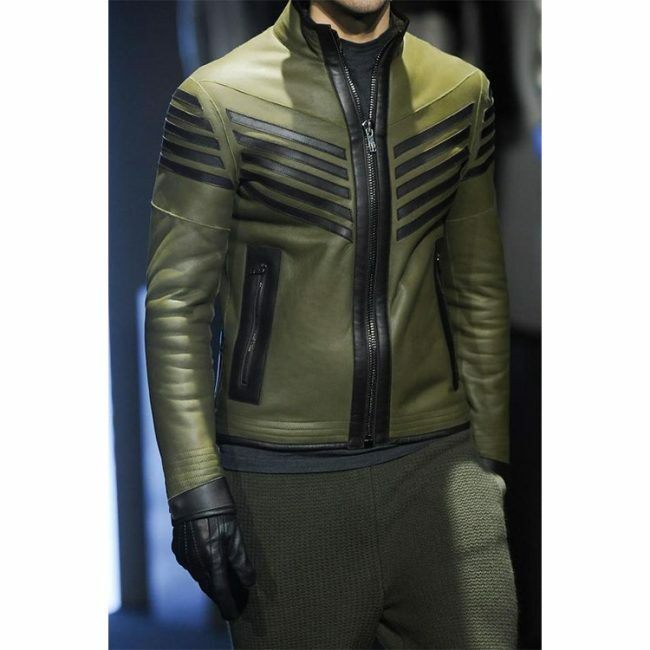 If biking is your forte and you are looking for a nice coat to keep your chest protected, you should not look further than this stylish green leather coat that has black stripes and a front zipper. You will look handsome in it. 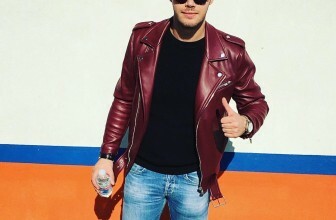 You will love this leather jacket just by looking at it. The pigment green color that it features looks great with no other color but black for the jeans. This jacket is perfect for winter because it covers the top part of your body very properly to keep you warm. The lime green color can match perfectly well with many jeans colors, including black, blue and grey. You can also wear it with official pants. 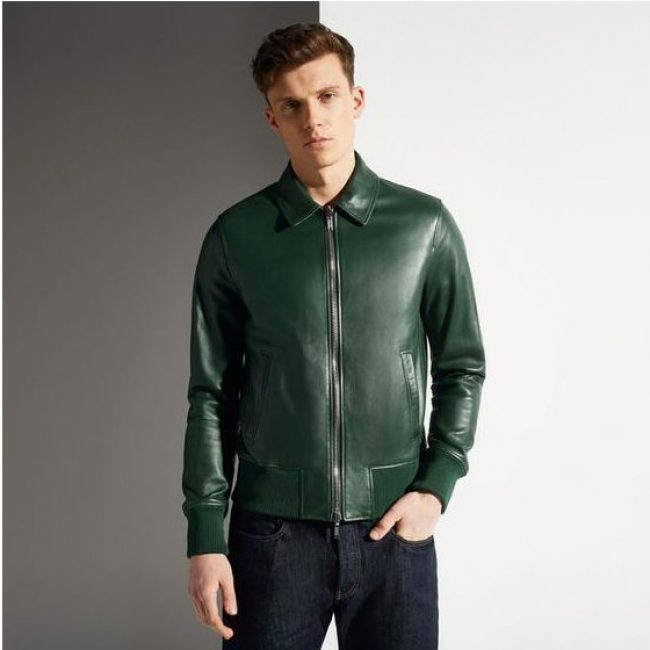 For a stylish street look, consider wearing a green leather bomber jacket with navy blue jeans and a white T-shirt. You can accentuate the style with black shades. If you are looking for a nice leather jacket with a Mandarin collar, this one will be a great buy. Since it is dark green in color, it will be perfect to wear with black jeans and a blue, grey or white T-shirt. 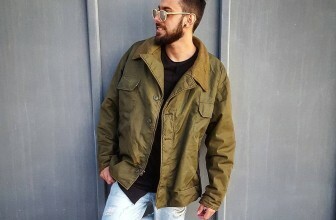 It is not only the military green color that this jacket features that makes it look great, but also how it has been styled. It will make you look very handsome. It goes well with a black T-shirt and grey/black jeans. 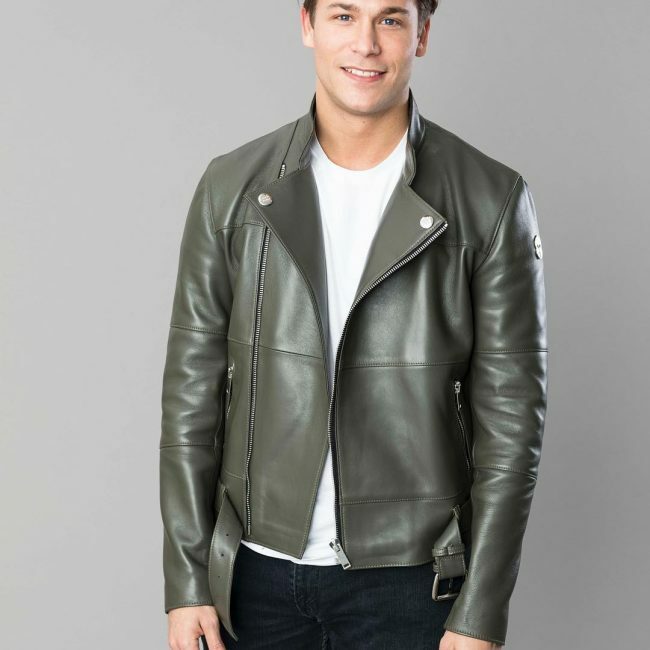 The reversible design that this leather jacket features is one thing that you will love most about it. The Brunswick shade of green can match effortlessly with most colors. 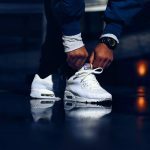 If simplicity is the policy that you operate with when it comes to the outfits that you put on, this style is a must try. You will still look classy though. The fern green jacket matches perfectly well with the grey T-shirt and black trouser. 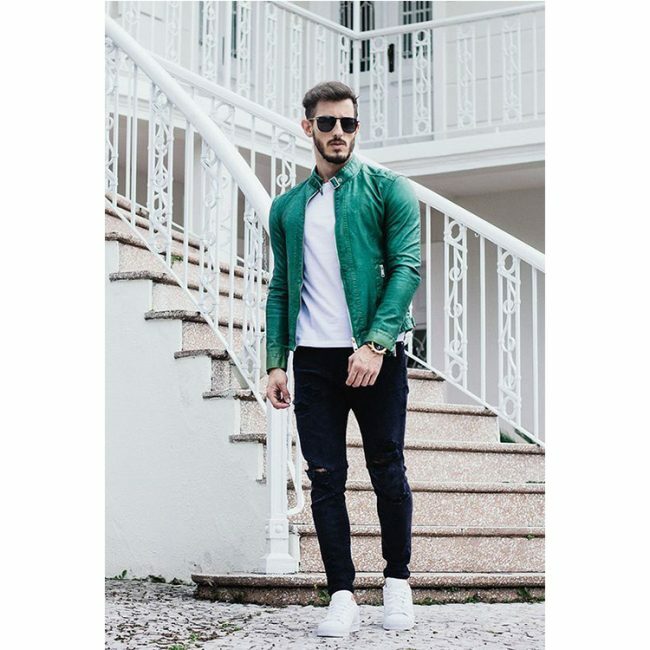 If you wear this collarless green leather coat and then pair it with classic a white shirt and tight brown pants, people will think that you are some celebrity from Hollywood. You will look awesome. 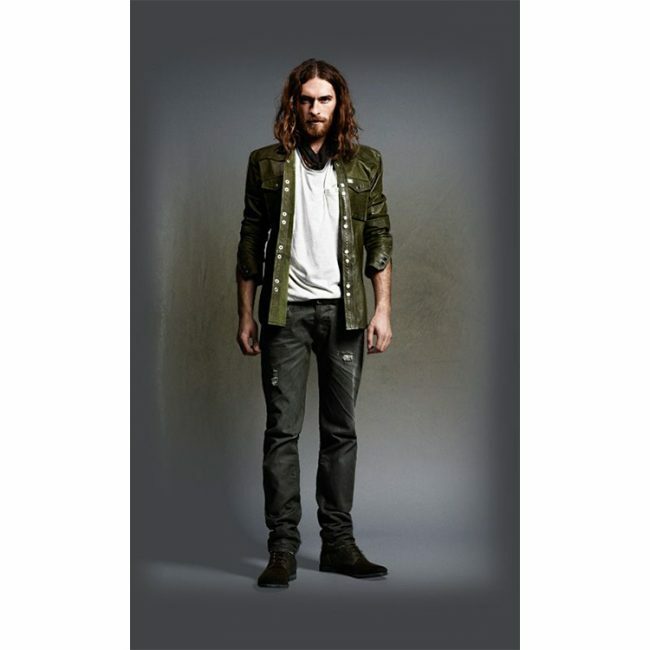 Black jeans and a white T-shirt will look great anytime when combined with a dark olive green jacket. You can button up the jacket or leave it open depending on your preference. Not only is this jacket nice looking, but it is also hooded to make sure that your head stays warm when it is too cold outside. 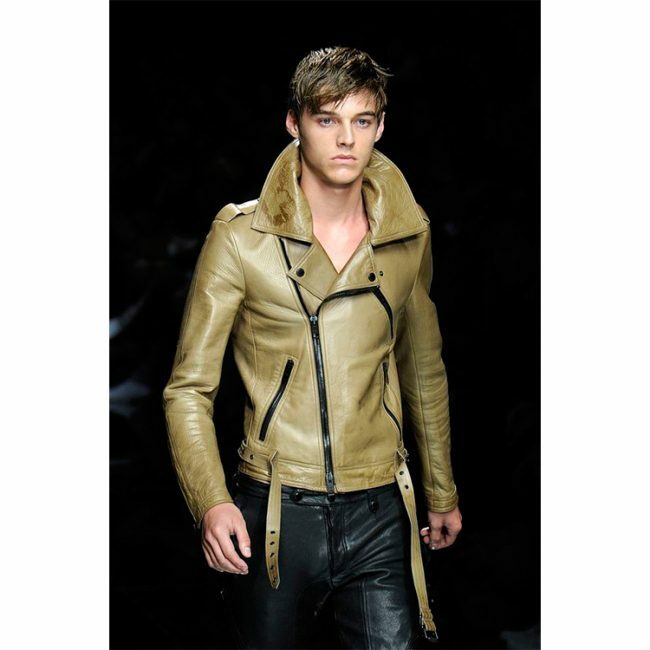 It is a nice leather jacket for casual wear and goes well with a T-shirt and jeans look. 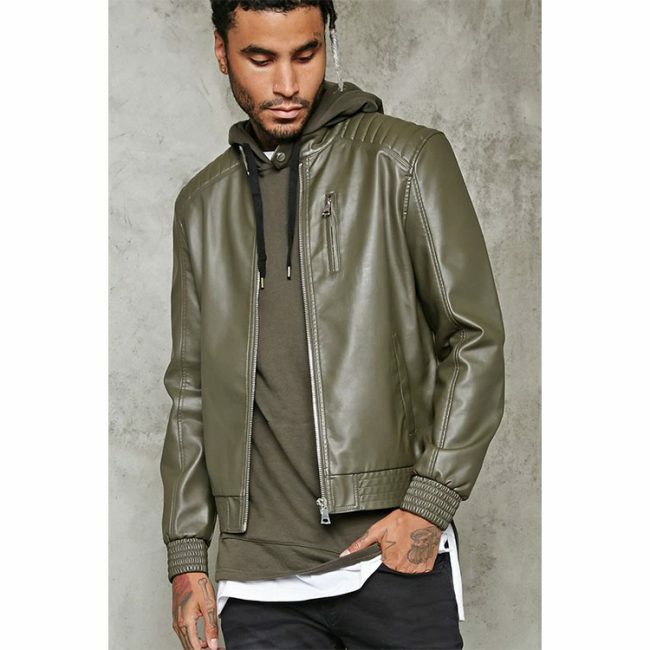 This avocado green leather jacket is very generous with pockets on the front side. It is also hooded. It will look great if you wear it officially with a white shirt and red tie. 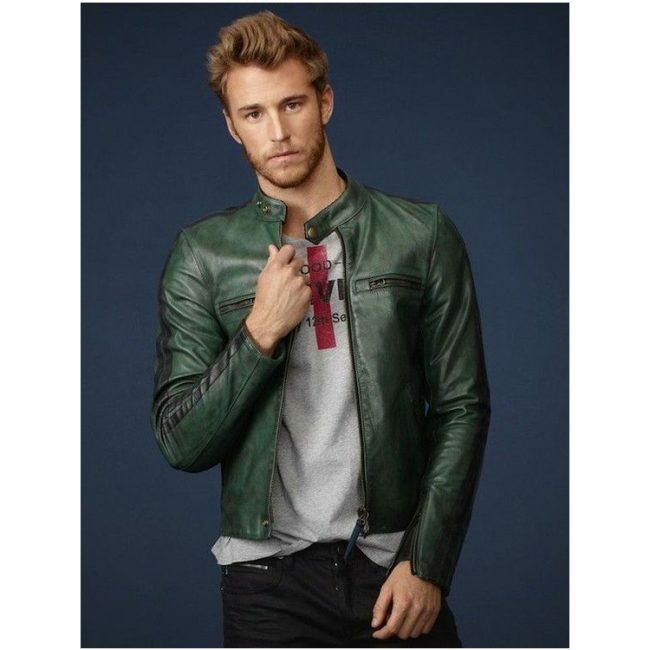 The above-mentioned green leather jackets are must-haves in your everyday life. You can style them any way you want. The big thing here is to know how to match the colors well depending on the shade of green you will choose.